logo done by deuteros75 :: send your logos to us and be a popstar ! Really,really great. Keep it on, guys! Wow! 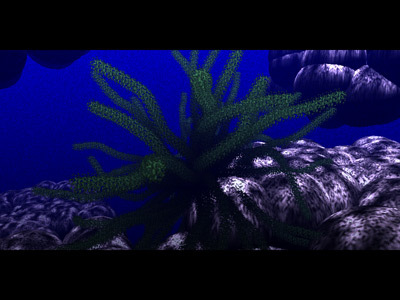 I like the way you make a simple, moving lightmap texture look like underwater lighting. Good stuff! The shade of blue used in this intro is between horrible and awful. It's 0xFF blue, or at least close to it. It doesn't look anywhere natural, something a bit lighter and a bit less BLUE would be a lot better. And the same goes for the green, there should be some variation in the hue. And when colors are the only thing you can complain about in a 4k intro, you know that the intro is good. Deserves thumb up as a cool 4KB intro? This is your first? Thats awesome. Synch, atmosphere, decent sound, pacing. Imo work on effects next. Thumb way up. Ended up soon but I quite liked it. Those rockz looks great. Was a nice production! Congratulations! Music is OK for a 4k demo! Doesn't do it for me. Piggy. a bit too dark/blue and i dislike the camera movement sync. however, good 4k! nice underwater scene. the camera motion is too repetitive for me. and I agree that it is a bit too dark. other than that, nice 4k. not top-notch,but still very good atmosphere here already.! rulez added on the 2008-05-21 02:50:01 by ɧ4ɾɗվ. After almost 3 years DMA is back with another spox release! Perhaps a bit to short but who cares..
Soso, it could had more interesting scenes to see. i would like to see that poland-revival getting true.!! on AMIGA polish coderZ just ruled.!! and not only coders btw.! added on the 2008-05-28 02:09:05 by ɧ4ɾɗվ. rulez added on the 2008-05-28 15:18:14 by chenmy! Great watereffect .. ugly fern ..
page created in 0.020696 seconds with 15 queries.